Resident Evil is a bit of a surprise in some ways. First off, the series is GCN exclusive for some time, due to a deal between Nintendo and Capcom back in 2001. 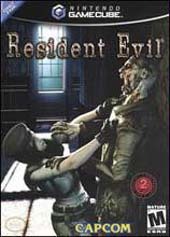 Second, instead of just a mere port of the most recent RE, which was Code Veronica X on the PS2, Capcom went back to the first game in the series and gave it a major graphical overhaul. While sticking to the pre-rendered visuals that was a mainstay for the majority of the series' run, rather than having a camera follow design in Code Veronica, RE still manages to pull of the most amazing visuals on any console so far. But the fact that it's pre-rendered gives Capcom a little less merit for it's efforts. The game, in a way, still plays like a point and click adventure. You can move, but the scenery can't really be touched. I admire the game's look, but it's interactivity is still pretty low. But that's not the worst thing about the game. Before we get into details, a little about the game's story (or premise). Back in 1998 (although the game was originally made in 1996), members of the S.T.A.R.S. squad investigates a mysterious occurance in a mansion outside Raccoon City. After the helicopter goes down, squad members find horribly mutated dogs chasing after them, and their only refuse is that mansion. After entering the mansion, you search for clues of what's going on, and keep yourself alive from the evil within. Now, on to the game play. It still plays like it did back in 1996. Unlike some games, this ISN'T a good thing. In fact, I think the control design has worsened, either by redesigning the game or by comparing it to other games in this genre. If you need to run from zombies, which are even more ballsy and aggressive than they have ever been, you shouldn't have to whip your character around 180 degrees and try to figure out how to run. For a "Survival Horror" game, correct controls and precise movement is neccesary for survival. Rather than calling the control schemes A, B, or C; be more realistic and call them "Run Into Enemy", "Run In Circles" or "Hope You Make It!". This is the worst facet of the game. As for design, it's kind of limited. You can't explore the environments here like you can in Silent Hill 2. You're limited to where you can go, and limited to what you can interact with. Not much can be affected by the player, other than certain objects that should be moved. While it seems limited, it's by no means awful. I've seen worse designs in game play than this, so RE shouldn't fear too much. I wish it would have been more like Code Veronica, but then it wouldn't be one of the best looking games around, wouldn't it? The graphics are top notch, although having pre-rendered backgrounds seems like cheating in a way. But if you compare these pre-rendered models to the past PS1 or DC Resident Evil games, the GCN's visuals are miles ahead of what was done in the past. The pre-rendered visuals are now in high-resolution, and even include some nice effects with lighting through video layering. If you've ever played Fear Effect, then you know how the backgrounds were all in FMV. Here, some backgrounds are, while others are static. The FMV backgrounds do add visual depth, and make the game less static than it used to look. And I love the character models. By far, these are some of the most realistic people I have ever seen in a videogame. While some designers tend to do some work on the face, and then just give them flat looking clothes, the entire body and outfits are modeled and textured nicely. My only complaint is that the characters don't really show any facial emotions while playing (just in FMV). Other than that, this game does look fantastic. The sound also shines pretty well here as well. While it doesn't use any Dolby Surround encoding (I don't think Capcom ever has used Dolby in their games), the sound is still very good and does sound three-dimensional. The voice acting is marginal. It's not nearly as bad as it used to be, but the actors seem uninspired by the screenplay. Then again, the actors in the RE movies seemed the same way. Still uses sound to it's advantage for frightening moments, and often is done successfully. If I made RE seem a little negative, that wasn't my intention. It's still a very good, very playable and a pretty challenging game. The game looks fantastic, and it looks better than ever. Also, since everything has been moved around, and that new things have been added, it does feel like playing a different RE game. I never quite liked the first game in the series, and never got too far into it, but now it feels like it's the RE that was meant to be. Some things are placed better, and is designed better than the first time around, and it just looks a lot better. A remake well worth checking out, but as it being the best "survival horror" game, it still has a way to go to catch up with the better. Recommended? Sure. The game looks great, but really, that seems like the only major change.